The little street with its “cul-de-sac” sign seems nearly pathetic. But since a Jewish group has applied for restitution of all of the lots, the present residents find themselves confronted with the threat of losing all their property. Each and every one of them must ask themselves whether they are complicit in something unjust. They dream up their own versions of the Jews, with stories that conveniently fit into their lives. This is the story of an attempted reclamation and its consequences. It is the living portrait of a community losing its security and homogeneity, in search of moral solutions that are almost never to be found. An unbelievable and uniquely German tale based on a true story: the Wall has hardly fallen when a town is battered by its past – and everything is called into question: law and property, good and evil. Translation rights of her former novels were sold to Finland and Israel. 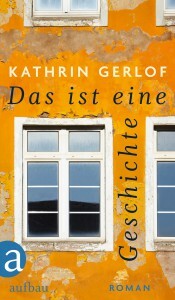 The author: Kathrin Gerlof was born in 1962 in Köthen (Anhalt). She works as an editor for various newspapers and lives as a journalist and author in Berlin. She published her debut novel „Teuermann’s Silence“ in 2008. Her second novel „All the Time“ was enthusiastically praised and sold in 40.000 copies.